So, last weekend spent in Switzerland in the company of stellar people from the Archers newsgroup. Fab time had by all: started off in Geneva with a lovely soiree on a balcony on a warm summer’s night. Excellent food, plenty of time for discussion and getting-to-know-you. I think I share elements of the same sense of humour with Gumrat which lead to some hilarity. Before leaving Bern we drove around it taking in some sights of old Bern, the Swiss Parliament (outside thereof) and a bear pit. 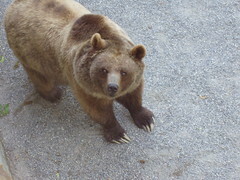 Photos of bears here. Many of them came out like photos you see of abused animals in street stalls, but these bears looked quite happy, if a little hot under all that fur. There was plenty of space in the pit, and vegetation, and water. About four bears in total, I think, three of which just wanted to sleep and a fourth was prepared to play tricks for the people above who were dropping vegetables straight into the hungry bear’s mouth. On to Basel, where we met up with further umrats including one who lives in Basel, and a group who’d flown in specially. Basel was celebrating something, not quite sure what, but included football team having won something. Small groups of about 30 men in various different mediaeval costumes were marching around with familiar but different tunes on pipes and drums that others identitified as the tunes for Scotland the Brave and British Grenadiers that probably have different words in Swiss German (like the French kids in Reims who seemed to be singing My Bonnie Lies Over the Ocean). Some over excited naked drunk men were playing in a fountain and our host felt she vaguely recognised one of them. After webcam, home to supper, and a good six hours of drinking, before crashing at a friend of a friend’s lavishly decorated Mackensie-style duplex apartment minutes away from the Rhone (or possibly the Rhine, I get confused). Walking home via this statue of Helvetica waiting for a boat to pic her up for her hols (Note suitcase, and spear and shield relaxed). Apparently, she has rugby socks on in season. 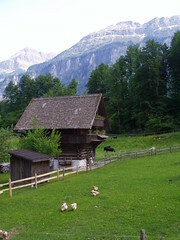 The following day we headed off en masse to Ballenberg, a museum of rustic Swiss life where they have dismantled houses from old Switzerland and put them in in a large rural park. There were fantastic pics to be had from all over, just Swiss chalets, snow covered alps, livestock with cowbells, a lake with huge leeches in it. A park full of postcard views waiting to be taken. And they also had fire pits and free bits of wood — for a barbecue, all you had to provide the meat and matches. After the barbecue we wandered around the park a bit taking in the sites, before it was eventually time to go our separate ways, half back to Basel, half back to Geneva. The following day, I bid fond farewell to my generous hosts, took a tram in to see bits of Geneva (an overcast day, so not great pics) then headed off in the Alps. They don’t go glompf glompf glompf. … which seems slightly counter-intuitive to me. However, we also know that Frogs say ‘Non’ to the European Constitution, which wasn’t a huge surprise given how many ‘Non’ posters there are all over the place. It was still a pretty close-run thing. I missed the vote in France, having been having a lovely time in Switzerland instead. In the Canton of Geneva, next weekend they’re having a cantonal referendum to check what the citizens think about Schengen and also a gay marriage bill. So far, Boulogne, Hardelot, le Touquet (Paris-plage) then on to Arras, Cambrai, then down the motorway to Reims (a visit round Taittinger), then Epernay, then Troyes (gorgeous). More on that later, when I’ve uploaded the photos. Now I’m in Switzerland planning to do Alp-y things for the next few days before heading down slowly to the Med. Then I’ll come back up via the Prynees and Brittany before picking P up at Dinard and heading over to Normandy and Paris. 50 km/h is basic urban speed limit, in force from when you see a town’s nameplate. 30km/h applies in front of schools and in really twisty streets. 70km/h is for country roads, up to 90km/h unless roundabouts, steep bends, etc approach. Dual carriageways get to 110km/h and on the autoroute, if you’re in a car, have been driving more than a year, it’s not raining and you’re not not towing anything, you can get up to 130km/h (about 82mph). Now, if I’ve got this right, why are the French always overtaking me? Driving aggressively behind me and flashing? I thought I was a bit of a speed demon, but I’m glad to see that obviously I’m not! The road here was amazing — the “White Motorway” that takes you round and over and under the Jura mountains, before it eventually takes you on to Alps, although I’m not sure I’ve actually seen an Alp yet. Sudden lakes, and huge viaducts are all par for the course, and it’s been tricky concentrating on the road when there’s such amazing scenery around. Whistlestop tour of Switzerland planned for the weekend, through Geneva, Bern and Basel, and we’re having our barbecue at Ballenberg. 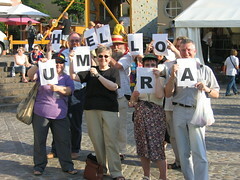 At some point, massed ranks of umrats (people who read the Archers newsgroup) will be waving at the Basel webcams. And I’ll upload new photos soon! Reims is very nice. A cracking gothic cathedral, lots of champagne, some beautiful streets and squares and some interesting public art. I spent a few hours hidden in a cinema watching the latest Star Wars in a gorgeous old building which boasted of a screen of 14m, and must have had a ceiling height of 20m, topped off in an old style wreaths-and-angels type carvings. The huge room had about 20 of us in there for the 17h30 showing, and boy, was the film terrible. After that, I wandered a bit trying to find the big champagne houses to save myself time in the morning, took a few snaps, and then settled on Les 3 Brasseurs for some dinner. They had a special menu of 2 flammekueches (one savoury and one sweet) and I tried to drink my way through as many of their home brewed beers as possible. I’d settled on a table just inside the brasserie because it was getting a bit cold to spend the night on the terrace, and I hadn’t been there an hour when the skies opened and it tipped it down. I had a very amusing half an hour watching totally unprepared thin young pretty French people run around and duck for cover, then a bit later watched the staff go outside to recover the wreckage from the tables. It really did rain pretty damn hard: ashtrays were full to brimming and even pint glasses were half full.